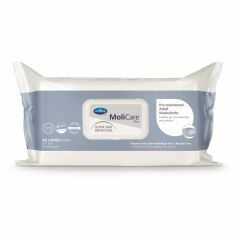 AllegroMedical.com presents The MoliCare® Skin Washcloths for active skin protection. Ultra-strong, soft and puncture resistant cloths are conveniently packaged in a space-saving, resealable pop-up dispenser. These puncture resistant cloths protect the caregiver during skin cleaning from incontinence episodes. Strong wipes provide faster and safer clean up. These soft pack, pre-moistened Adult Wipes are perfect for travel or for storing in a bathroom or bedside drawer. Dermatologically Tested - hypoallergenic wipes give you piece of mind from skin reactions. MoliCare Skin Washcloths are all about skin protection enriched with Aloe Vera and Lanoline you can expect a skin-friendly pH of 4.5-6.5.